As a full-service site-preparation company in the Raleigh area, OnSite Resources is committed to providing a comprehensive selection of hardscaping services to meet all your residential construction needs. We understand how important it is to make sure your Raleigh, NC home exterior and outdoor space is attractive and has curb appeal, which is why we specialize in stone veneer installation. 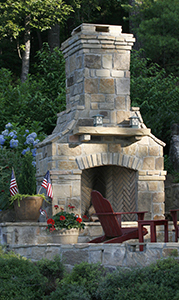 Whether you are looking to spice up the look of your outdoor fire pit or your garden’s retaining walls, OnSite Resources offers a variety of stone veneer options that match our customers unique tastes and styles. To learn more about the types of stone veneer options we offer, please contact our office at (919) 266-4479. We look forward to meeting all of your residential site-preparation needs! OnSite Resources is proud to provide stone veneer installations and constructions to customers in Raleigh, Knightdale, Durham, Chapel Hill, Cary, Morrisville, Wake Forest, Apex, Garner and surrounding NC areas.